The Someday Lounge is a special room just off the downtown side of the Burnside Bridge. 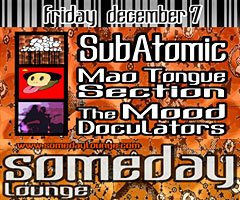 We were invited to share the bill with PDX bands "SubAtomic" and "The Mao Tongue Section". Both delivered unique and inventive sets spanning a variety of genres. The room itself has a great vibe thanks to very cool design and decor, as well as a great sound system. Our set featured versions of "Heat of the Night", "The Void", and "Shifter", all of which had not performed in a while. We also debuted another drum-loop-based piece called "The Hustle" which opened things up nicely. There are unfortunately no pictures to post of the evening, but the show was filmed and you can watch the video on Someday Lounge's website. This was a fun evening. The Someday is a hot little venue in the just-about-seedy part of town, which was a perfect match for the Docs. They lit up the stage and drew a spirited crowd. Looking forward to checking them out at the Someday again soon.